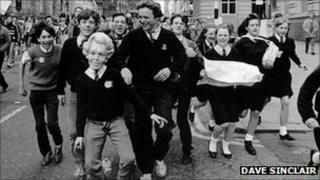 It was the day when school really was out for thousands of Liverpool teenagers. In April 1985, a protest against the Conservative government saw children across the city swap the classroom for the streets in a mass strike. Arriving at St George's Plateau, in numbers far greater than anyone expected, they overwhelmed organisers and police, and ignoring the official march route streamed through the city's streets. Local photographer Dave Sinclair, then 26, ran alongside the children as they made their way to the city's Pier Head. The images he took on that day are part of an exhibition, Democratic Promenade, at Liverpool's Bluecoat Arts Centre, which looks at the city's radical past. Mr Sinclair was a student in Liverpool in the late 1970s when the area's unemployment rate began to steadily rise. "I was living in Everton, I'd been there when all the factories had been pulled down," he said. "Tate and Lyle, Bibby's, British American Tobacco, all the big factories that had been in Everton and around the docks had gone. "I was just surrounded by this rubble and apocalyptic landscape, I started taking photographs because it was such a dramatic landscape I was living in. "My politics had always been left leaning anyway, and by 1985 I was taking pictures for The Militant newspaper, as well as doing my own projects." In April 1985, a series of protests were organised across the country in opposition to the Conservative government's plans to make the Youth Training Scheme (YTS) compulsory for any young person who was unemployed. The measure was planned to reduce unemployment among young people and provide them with training and skills, but many complained that the scheme, which didn't guarantee a job at the end of it, was used by employers as a way of obtaining cheap labour. In Liverpool, where youth unemployment was reaching record levels, thousands of children who were reaching school leaving age took the day off to take part in the march. "There had been a leaflet campaign and a lot of word of mouth, but on the day we had no idea it was going to be as big as it was," Mr Sinclair recalled. "Some schools closed because kids didn't turn up, some saw it as a day of sagging off. "It was stewarded by Liverpool Labour councillors, but we lost control of it when that amount of people turned up. "It was meant to be going from St George's Hall through the city centre to the Pier Head, but once the kids heard the words "Pier Head", they just went straight down Roe Street and Dale Street - they just ran. "It was so fast, and the numbers were so big, that we couldn't stop them and redirect them." The children raced past Liverpool Town Hall to the waterfront, where they were addressed by a number of speakers, including local Labour MP Terry Fields. "The environment in Liverpool then was quite different to now, it was a bit more bleak," said Mr Sinclair, who has lived in London for the last ten years. "Places like Croxteth it was something like 80% youth unemployment, almost everyone you knew between 18 and 23 was on the dole." Following the protests the government retreated from proposals to make YTS compulsory, although it did later return to the plans. "It was a small victory, but there weren't many victories under Thatcher," Mr Sinclair said. "It gave you an amazing sense of optimism at the time, although politically it didn't achieve what we were after." Democratic Promenade is at Liverpool's Bluecoat Arts Centre until 27 November.